The recent Full Moon on December 13 certainly stirred up some interesting activity — and right along the lines of the signs involved: Sagittarius & Gemini. Since transportation is associated with both of these signs, it wasn’t surprising to hear about the railway strike in Great Britain that began that day. It affected over 100,000 people and is considered the worst strike of its kind in over twenty years! And a pretty inconvenient time, eh? At the same time, Alaska Airlines announced its acquisition of Virgin America — an timely action related to the Sagittarius/Gemini axis and its emphasis on transportation and travel. It was obviously in the works for some time, but came together at the Full Moon. Also on the 13th, the long-awaited nominee for the new Secretary of State was finally announced: Rex Tillerson, Chairman & CEO of ExxonMobil. 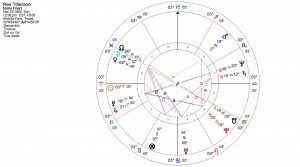 As you can see from his solar chart below, he is an Aries with his Moon, Venus & North Node in Pisces (the sign associated with oil). He’s been with Exxon for over 40 years, so he is certainly living out his horoscope! And Aries individuals are naturals at business and in opening up new territories — which fits him to a T. He is a very worldly individual, and the timing of this announcement was once again very fitting for the Sagittarius/Gemini Full Moon! However, due to his quirky Sun/Uranus square, it’s possible that his strong ties to Putin & Russia (a very sensitive issue these days) may be too controversial for Congress and could derail his nomination. As with many of the current cabinet nominees, he’s an unusual choice : he’s a businessman, not a diplomat or politician. It will be interesting to see if he can, in typical Aries fashion, push through all the conflicts of interests and actually take on the role of representing the US on the world stage. Last but not least, a major report on the status of US education in relation to the rest of the world was released. It showed the US near the bottom in math, and in the middle in reading & science. It seems that there is more of an emphasis in US schools on social media & athletics than on learning. This is a sad commentary on our educational system — and we have certainly been seeing the results of this lately. Since the signs Sagittarius & Gemini relate to education, knowledge and global affairs, it’s obvious that we need to raise some awareness here…if we want to keep up with the rest of the world! So much misinformation is circulating these days, mostly due to social media, that it takes a questioning mind to sort out truth from fiction. It’s unbelievable that fake news is getting more attention than the real thing. What is that saying about the people of this country??? Full Moons tends to illuminate issues and bring them out in the open. Perhaps life is so overwhelming these days that people would prefer being in La La Land!